Is your seat belt no longer retracting? 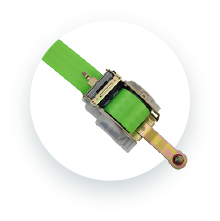 Are your seat belt parts worn from years of use? Is your seat belt webbing frayed from years of use or perhaps did your dog decide to make a snack out of the seat belt webbing and chew into oblivion? Maybe your buckle and tongue don't "SNAP" together (or at all) like they used to? If any of these things describe the trouble you are having, there's a good chance we can help. 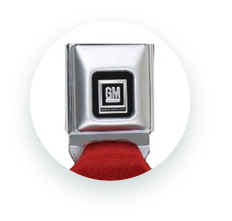 We take seat belt repairs very seriously and will tell you right away if we don't think we can help. 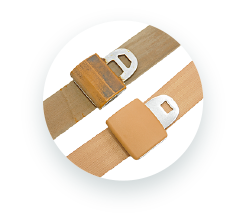 Otherwise, a key part of a repair is bring the broken seat belt in-house to evaluate it. Before you spend the big bucks on a factory replacement, give us a chance to save you some money with a repair or aftermarket replacement. Copyright © 2019 SeatbeltPlanet.com. All Rights Reserved.